Actually, it's not just an exceptional case, but quite common for Mac users desperate for AVI playback. AVI is among the most widely used formats of video today, applying for many media players but there is always avi not playing on QuickTime. Why? As a container format, AVI is not a specific type of file with unified compression and there is no single codec for AVI videos. This is the reason why we cannot play AVI on Mac OS. Fortunately, a man's wisdom is infinite as the outburst ideas of playing AVI on Mac computers. Though QuickTime Player is not available, there are still some other AVI media player for Mac such as KMPlayer, VLC, 5KPlayer etc. That is to say we can fall back on any one of them to play AVI files on Mac OS X including Sierra, El Capitan without any freezing, buffering, or crashing issues. 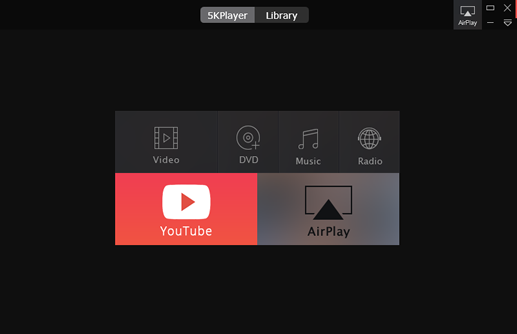 Take 5KPlayer as an example, as one of the best AVI players for Mac, it is a totally free video player for both Mac and Windows users, enabling you to play any videos like AVI, WMV, HEVC, MP4, MKV, MOV, download YouTube videos, and even DVDs on Mac/PC. The easy-to-use interface indicates the easy step in one click. Just add corresponding files to import, and all things done. Step 1: Download 5KPlayer and get ready to import AVI file. ③ Right click on target AVI file, click "Open with" option then select "5KPlayer". And then the AVI file is successfully run on Mac and you can enjoy your AVI movie/music right away. Moreover, it is possible to switch audio tracks, change aspect ratio, manage your downloaded videos, and insert subtitles and so much more with 5KPlayer. In order to run AVI files on Mac, you can simply convert AVI to Mac supported formats with the help of AVI files converter for Mac. 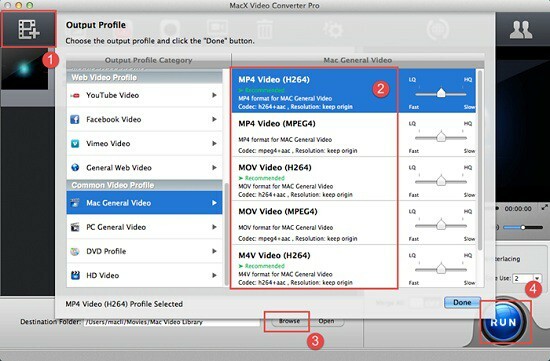 MacX Video Converter Pro can perfectly meet your needs as a powerful AVI converter for Mac. The top Mac AVI files converter can absolutely do you a favor by converting AVI to MP4, MOV, M4V, formats supported by Mac OS. Actually, it supports almost all video audio formats converting including MKV, FLV, 3GP, WMV, M2TS, 4K 8K videos etc. Not only that but you will be definitely surprised by its super faster speed and up to 98% high quality of converting. Moreover, if you have no idea of what formats Mac OS supported, this AVI converter Mac is specially designed for you with more than 350 profiles preset including Mac general videos. 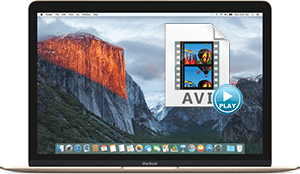 Once you have accomplished the converting process of AVI to MP4, AVI to MOV, M4V, you can effortlessly play AVI files on Mac OS(Sierra, El Capitan included) such as MacBook Pro/Air, Mac mini, iMac, iMac 5K 4K etc. 1Add AVI videos. Free download this AVI video converter on Mac and install it, click "Add File" button to add your AVI file to be played on Mac. 2Select output format. To convert AVI for playing on Mac, simply select the target format "MP4 video" button. Of course, you can choose "MOV Video" or "M4V Video" as well. Note: there are ready options for avi to iTunes, avi to iMovie, QuickTime and other Mac programs, Apple devices and others. 3Select output folder. Click "Browse" to specify output folder on your computer, saving files to the path you chose for your files. 4Start conversion. Click "RUN" button on the lower right corner to start converting AVI to MP4. After completing the steps described above, there is no barrier for you to enjoy AVI on Mac OS. In addition, MacX Video Converter Pro also works well in converting MTS, M2TS, AVCHD, WMV, FLV, MKV to MP4, MOV, M4V to play on Apple devices like iPhone 6S/6S plus, iPhone 6/Plus, iPad Air 2, iPad Mini 4/3, Apple TV 4, iTunes, iMovies etc.